The Nokia Lumia 520 is the most affordable Windows Phone 8 handset from Nokia, bringing features like camera lenses previously reserved for higher-end smartphones to the masses. The Lumia 520 sports a 4-inch super sensitive touchscreen and is powered by a 1GHz dual-core Snapdragon S4 processor with 512 MB of RAM. Most importantly, it comes with the promise of fluidity and consistency with Windows Phone 8. The device has the typical Nokia design touches with interchangeable covers that many and especially the younger and hip will like. The camera is a 5-megapixel auto-focus affair that sadly lacks flash. As we already mentioned you can augment the experience with lenses like the neat Cinemagraph for animated images, a feature we first saw in the Lumia 920. Aperture is f/2.4 which is not bad for low-light photography. The camera is capable of recording 720p HD video. Of notable absence is a front-facing camera and NFC connectivity, though. You get 8GB of internal storage that you can expand via microSD cards. 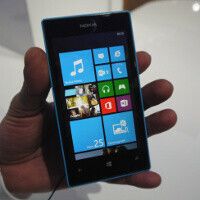 The Lumia 520 packs 1,430mAh battery that lasts for 9 hours in 3G mode, and 6 hours of Wi-Fi browsing. Finally, good news is the device will arrive in the first quarter in Hong Kong and Vietnam, and more massively in Q2 in Europe, China, India, Latin America and Africa. In the States, Nokia has secured a deal with T-Mobile and while off-contract the device will cost around 139 euro before tax, we expect it to be free when you sign a new T-Mobile 2-year contract. Hmm I was thinking of grabbing the 620 to use strictly as a media device but I might have to consider this phone now. Fianlly! An end of the torture called 500! Instabuy. I was considering this little guy until I got to "of noticeable absence". For some people not a big deal but for me to go to a smaller screened phone with no ffc would be a downgrade for me.